Every year, hundreds of students graduate from the University of Edinburgh with Masters degrees in Environment and Society related programmes. 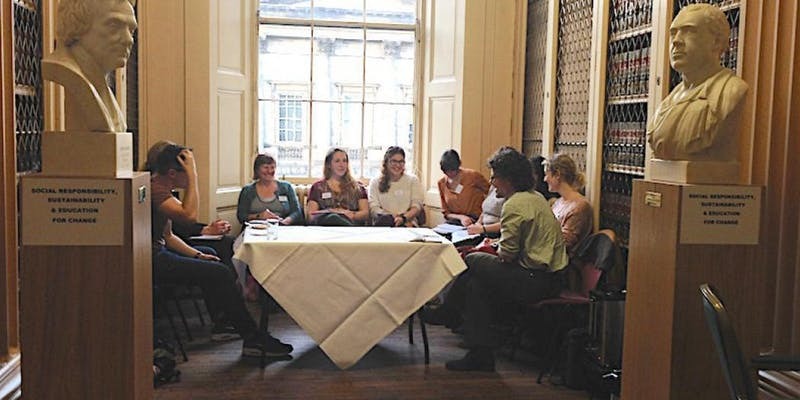 The Research Mixer, organised by GESA, School of Geosciences and the Department of Social Responsibility and Sustainability, is a chance for practitioners and academics to share sector knowledge and explore possible research or practice opportunities. For students it's a unique opportunity to discuss their own research ideas with our academics and practitioners. The Mixer is made up of discussion groups around Research 'Clusters'. Each Cluster is a grouping of interest within environment and society. Please note that you can select a maximum of 3 clusters. Each Cluster will run three 25 minute facilitated sessions throughout the event. Students will have a chance to pre-select three Clusters to visit and will spend 25 minutes in each with academics and practitioners. During the sessions, academics and practitioners will have the opportunity to quickly share sector knowledge, potential projects, and research priorities. Students will have an opportunity to outline their research interests and to make connections. There will be two breaks which all attendees are encouraged to use for more in depth conversations. This is an unticketed event. You can usually just arrive at the venue, but we can't guarantee entry if the event is very busy.